One-day IoP Meeting: Complexity and Nonlinear phenomena in Biological systems, University of Bath 20th May 2010. On May 20th 2010 our group held its second meeting, a one-day conference titled “Complexity and Nonlinear Phenomena in Biological Systems” at the University of Bath. The purpose was to bring together different aspects of complexity and nonlinearity related to a variety of biological systems. We had one keynote speaker, ten contributed talks, and over fifty delegates. Our invited speaker Prof. Ray Goldstein (DAMTP, Cambridge) opened the morning session with his talk on the synchronization of eukaryotic flagella, Fig. 2. Prof. Goldstein and his group have been investigating the origin of flagellar synchronization, providing evidence which shows that the synchronization of flagella is flow-induced and that there are stochastic transitions between synchrony and asynchrony. Fig. 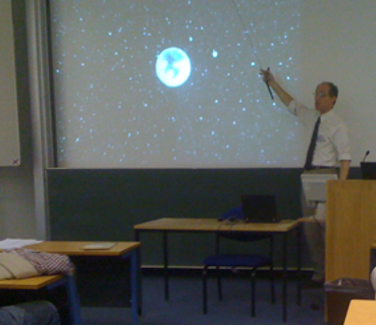 2: Prof. Goldstein showing the dancing volvox and induced flow-field at the “Comlexity and nonlinear phenomena in biological systems” meeting, University of Bath, May 20th 2010. Dr. Michael Swift (Nottingham) and Dr. Paddy Royall (Bristol) continued with talks on nonlinear phenomena in granular and colloidal systems, respectively. In the afternoon session participants heard talks on biological problems on the cellular and molecular level. Dr. Matthew Turner (Warwick) discussed the physics of fibre-like protein aggregates, whilst Dr. Robert Endres (Imperial) presented a model showing that phagocytosis can proceed even without actin polymerization. Dr. Rainer Klages (QMUL) talked about the anomalous (nonBrownian) dynamics of cell migration, Prof. Alexander Gorban (Leicester) gave an asymptotic analysis of microRNA and Dr. Mario Nicodemi (Warwick) described a statistical mechanics approach to understanding the process of X chromosome inactivation. In the final session the focus turned to larger scales and population behaviour, with Prof. Sandra Chapman (Warwick) investigating a model explaining the ubiquity of macroecological patterns across ecosystems; Dr. Christel Kemp (Paul-Ehrlich Institute, Germany) who discussed a mathematical framework which can be used to study the co-evolutionary process for transmission networks in epidemiology, and Dr. Joanna Bryson (Bath) who closed the conference debating the extent to which a species relies on socially acquired behavior rather than genetic inheritance or individual learning.